We provide our client an excellent quality range of Aluminum Platters which are manufactured from high grade quality raw materials. These Platters can be customized as per our precious customers specifications. These Platters are widely known for its durability and quality. 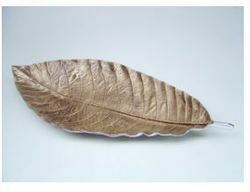 We are the leading organization in the industry to provide our clients the best quality array of Leaf Platter. The unique artefact is hand crafted by skilled craftsman.It is the finest gold art work on marble.Real gold leaf has been used for exclusive and traditional designs.It has been enamelled to protect this beautiful artistic work.